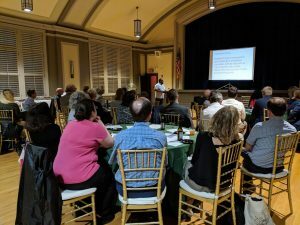 The Southeast Section’s annual event brought together planners in Lansdowne Borough, Delaware County to explore how communities can leverage history and the arts to revitalize communities. The event was held on Wednesday, September 12, 2018 and included a walking tour and panel discussion as well as time for socializing. The evening started with a one-hour walking tour of downtown Lansdowne, highlighting how Lansdowne is using its historical character to create economic development opportunities. Intrepid planners braved a downpour but were rewarded with a tour of two innovative (and dry) sites in the borough. The tour started at Utility Works, a former Delaware County Electric Company building that has been converted into co-working artist studio space. The building is operated by the Lansdowne Economic Development Corp. and houses artist studios as well as more flexible spaces. There is a rotating gallery space and a juice bar to take advantage of the street frontage. 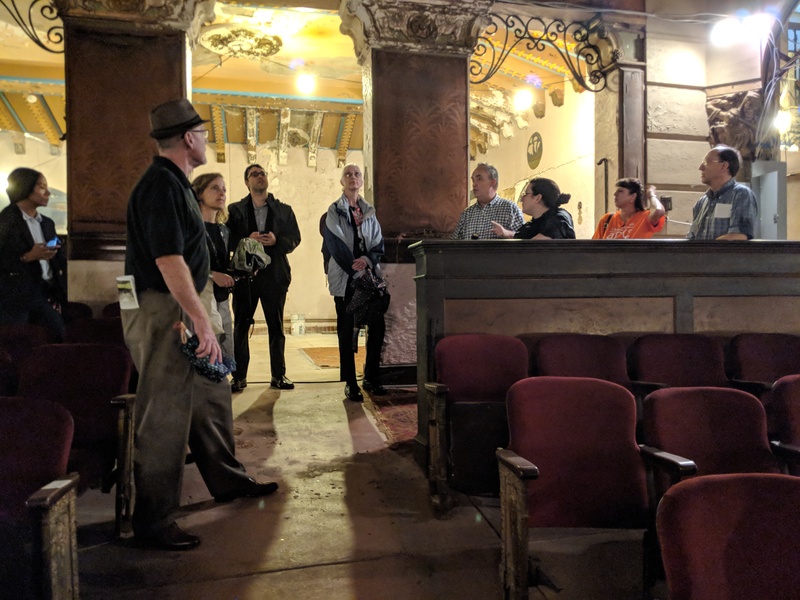 The tour then continued to the Lansdowne Theater, a 1920s movie house that is being restored and converted into a live music venue. The architectural highlights of the building were called out by Matt Schultz, Chief Executive Officer of the Historic Lansdowne Theater Corporation. He pointed out some of the key features of the building and the plan to convert it to a live music use. There was also discussion about how this new use could help spur economic revitalization in Lansdowne Borough. The tour ended at the Twentieth Century Club, where the presentation on Leveraging History to Revitalize Communities was held after Justin Dula, Chair of the Southeast Section, welcomed attendees and gave a section update (see presentation here). The presentations, which covered a variety of perspectives on historic preservation, from statewide to specific projects. The panel was moderated by Rebecca Ross of the Delaware County Planning Department, who also highlighted Delaware County’s Historic Preservation Plan. Elizabeth Rairigh of the Pennsylvania State Historic Preservation Office discussed how the State can assist with local preservation efforts (see her presentation). James Wright of the People’s Emergency Center discussed how history is uniting and revitalizing communities along Lancaster Avenue in Philadelphia (see his presentation here). Finally, Kate Cowing of Materials Conservation spoke about the adaptive reuse and restoration of the Union National Bank Building to be used as a technology company Linode’s headquarters in Philadelphia (see her presentation here). The presentations rounded off with a panel discussion and questions and answers from the audience. There was also plenty of time for networking and food and drinks. It was a successful and fun event.